London South Bank University (LSBU)'s top Product Design students have been selected for the final stage of the Design Museum’s annual student design competition. The 'Design Factory: Competition for BA Students' is a multi-disciplinary project that invites design students to develop conceptual responses to an exploratory and experimental design brief, spanning product, fashion, graphics and spatial design. This year’s creative brief was developed by interactions designer and Designs of the Year 2015 nominee Alexandra Daisy Ginsberg. It asked students to design a novel system of making that would result in different ways of consuming, using or disposing of designed objects. All second-year students studying LSBU's BSc (Hons) Product Design participated in the competition, producing a range of design proposals in response to the challenge brief. 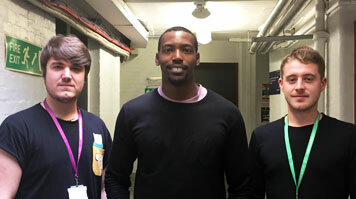 Of all the students participating in the national 2016 competition, three from LSBU - Chris Jobson, Rodrigo de Carvalho and Michael Byrne - were selected by competition judges to progress to the next stage of the project. Their prize was to attend a Design Symposium held recently and attended by successful students from universities across the UK. Their designs included: a low energy lighting system called City Glow, which uses natural bioluminescent algae to provide lighting in parks and other public places to keep runners and walkers safe at night; Kindogo, an alarm and alert system to reduce risk of kidnap in Uganda and help children to travel to and from school safely; and River Aid, a waste collection system located in rivers to reduce the amount of plastic getting in to the sea and oceans. Find out more about studying Product Design at LSBU.